Special religious devotions are those for particular places, individuals, and events that have been said to have taken place in history. 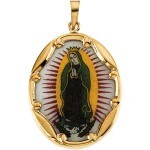 One of the more popular devotions is that of Our Lady of Guadalupe, the beloved patroness of Mexico. There’s an article on ChainzOnline titled Our Lady of Guadalupe describing the vision and story, and Santca.org is a wonderful site dedicated to the patroness. Many of us have an “image” of Mary that comes immediately to mind when we offer prayers to the intercession of the Blessed Mother of Jesus. In my mind, Mary looks a lot like a younger version of many of the important women in my own life. For many, images of classic Madonna’s by Rafael or sweet holy card remembrances are the face of Mary. Despite her “look”, worldwide devotion to Mary remains constant. Thanks to a wonderful new book by Ann Ball, we can learn more about stories, devotions and images of Mary from around the world. In The Other Faces of Mary (Crossroads, December 2004, paperback, 160 pages), Ball introduces us to Mary through the eyes of our fellow Catholics in places such as Vietnam, Nigeria, India, Japan and more. Ball and the many contributors to this book share with us a beautiful gift – the wonderful pictures that accompany the stories and reflections in this book left me wanting to travel to these places and see my own Faith through fresh eyes. Q: Ann, you’ve written on such a broad array of subjects. Please briefly describe this book and tell us what prompted you to take on the topic of lesser known visions of Mary. Q: When watching recent events at St. Peter’s during the death of Pope John Paul II and the election and installation of Pope Benedict XVI, I was struck by the universality of our Catholic faith as evidenced by the many faces and flags represented in Rome. While the ethnicities varied, devotion to Our Lady and the Rosary seemed to be a common thread. Could you say a few words about Mary’s place in our world today as a unifying force? A: God bless the internet! When writing my first books, my postage bill was enormous and it sometimes took months to get a response. The internet has made it vastly easier to communicate with others overseas. For some of these I appealed to friends. For example, my friend and long-time correspondent Leo Knowles (R.I.P.) traveled in England to bring the story and picture of Ladyewell. Leo was also a Catholic writer, and his essay in this book is the last he wrote. A Vietnamese Buddhist friend from Houston was going to Vietnam and looked up a Catholic friend of his there who found the information on Tra Kieu for me. I knew of the three handed icon and own a lovely copy of it written by my friend Mary Talamini. Naturally I asked her to comment on why she picked that particular icon to write. The one from Japan I saw myself on a trip there and it immediately reminded me of a lovely song I remembered from the 1960s. The author of that song was gracious enough to write a comment for me. For others I appealed to dioceses and priests all over the world. Actually, the stories behind the stories are all interesting. As a researcher who loves Our Lady, this was sheer pleasure for me. Q: Is there any one “face” of Mary that holds particular devotion for you? Which of the images in the book did you find the most compelling, surprising or interesting? Q: In his introduction to your book, Bishop Gregory John Mansour speaks of Mary as a “common bond” between Muslims, Christians and Jews in today’s world. Given the global uncertainties that face us in this time, I cling to my family’s daily prayers to Mary for peace and reconciliation as a sign of great hope. How can Our Lady help us explore and appreciate the cultural diversity of today’s world? Q: Ann Ball, author of the great treasure The Other Faces of Mary, thank you for another wonderful book and for your time. Are there any additional thoughts or comments you’d like to share? Lisa M. Hendey is a mother of two sons, webmaster of numerous web sites, including www.catholicmom.com and www.christiancoloring.com, and an avid reader of Catholic literature. Visit her at www.lisahendey.com for more information.